Thirty minutes into Constantine, I was noticeably impressed and excited to be at the mercy of an original film. After an hour, I was confused. Three-quarters of the way through, I was excited and disappointed. By the film's conclusion, I was duly torn. Wrapped in a bow that dazzles with special effects and over-the-top histrionics, Constantine is really a traditional tale depicting a classic good vs. evil struggle between those most ancient of adversaries: the Devil and his many protégés vs. his antithesis: Good. However, Good in this film is not so good. Meet John Constantine, played by Keanu Reeves: a supernatural detective too edgy for Heaven but too conscientious for Hell. Constantine is relegated to Earth, or in Dante-speak, Purgatory, because his transgressions clash with his benevolent spirit. Policewoman Angela Dodson, whose twin sister committed suicide and is suffering in hell, lures Constantine into taking her case; the goal is to determine whether or not the twin actually belongs in the Big Down Under. The unusual sleuthing duo must battle a number of demons in a post-apocalyptic Los Angeles to bring closure to Dodson's unexpected suicide. During his quest, Constantine must also wrestle with the Angel Gabriel (as if an army of demons wasn't enough! ), who grudgingly dislikes him and his attempts at retribution. The battle royal reaches a climax when pandemonium breaks loose and Satan himself steps in the ring to tangle with Constantine. As in The Matrix films, Reeves once again shows his flair for post-modern stories that mix as many mediums and philosophies as possible. Constantine is overtly draped in Christian narratives, characters, and principles. The film also pulls from the detective traditions of film noir, using the chain-smoking, debonair, and lone-wolf detective as the sole guardian against not only a handful of criminals but a vast network of evil conspirators. Director Francis Lawrence, known primarily for his music video work, also shines with rapid cutting sequences and a soundtrack that features an eclectic mix of songs from among others A Perfect Circle, the Dave Brubeck Quartet, and Flaco Jimenez, a Mexican accordionist considered one of the world's best. The pattern here is clear: mix mediums, mix cultures, mix morality, and mix traditions. In other words, the only way to be original is to borrow from everything. Clearly, the most obvious medium Constantine borrows from is the comic book it was based on: DC/Vertigo's Hellblazer series. In this series, John Constantine is deliberately portrayed as an amalgam of post-modern angst-ridden characters. He smokes constantly but suffers from lung cancer. He dresses in black and white to mirror the paradox of his moral history. He wants to help Angela, but not for the most obvious of reasons: her sexual appeal. He speaks softly (too quietly - Keanu, speak up man!) but carries a big stick. He is a detective, that paragon of logic and reason, yet his investigations are usually based on supernatural gimmicks, magic, and witchcraft. He is the perfect paradox. The film also features that hunky lead singer from the band Bush, Gavin Rossdale. He is surprisingly effective as Balthazar, a devilish demon relegated to Los Angeles to wreak havoc on Constantine and the other antagonists of Satan that walk streets along the City of Angels. Rossdale's performance is coated with some amazing special effects, but when he actually is forced to act, he does a decent job while serving as an evil parallel to Constantine's persona. Djimon Hounsou of Amistad fame also works well as the morally ambivalent racketeer named Midnite. While both of these characters warrant more complex development, they successfully convey the stock, one-dimensional personalities of pulpish literature, which is the source material for this flick. The computer-generated special effects are clearly Constantine's most impressive contribution. In fact, they probably outshine everything else in the film. 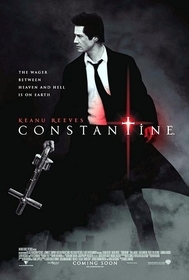 At one point, a demon composed of bugs and other nasty creatures attacks Constantine. These effects are stunning. The depictions of hell, while reminiscent of the underworlds depicted in The Lord of the Rings trilogy, also scream with visual ecstasy and remind one of medieval and Renaissance artwork depicting Revelations and other Biblical scenes of Armageddon. And early in the film, when Constantine first flashes his supernatural acumen, he exorcises a young girl by capturing the demon's reflection in a mirror and then extracting it from her body. This was perhaps the most original and provocative scene in the film. Unfortunately, it occurs in the first few minutes. Nevertheless, the special effects alone are worth the price of admission. The main problem with Constantine is that it tries too hard to dazzle, and at times, relies too heavily on its glimmer and not enough on its substance. This is probably not by coincidence; the story is average at best, and Reeves in particular, although adept at depicting existential antiheroes, should be able to generate more emotion from us at this point in his career. 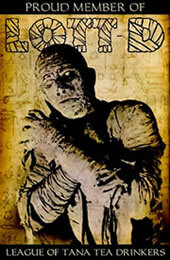 In this film, his typecast role reminds us more of his mediocre acting abilities than his talents. In The Matrix, he could get away with it; here, he cannot. He is too talented, I think, to let this trend continue. The film is also unsure of itself: does it want to be fantasy? Horror? Science fiction? Film noir? Viewers are left wondering where its soul rests. Sometimes, a mixed-genre offering works well, but only if the parts are equal to the whole. Here, viewers are left wanting more footage of hell, more scares, more science, more character development, or more something. Constantine has prequel/sequel written all over it, and that is probably a good thing, but only if the sequel can round out the rough edges that make Constantine a prickly success at best. In the comics, Constantine is British and blond.